My husband is a middle school guidance counselor in the town we live in, who just completed his administration license to become a principal and is currently writing his dissertation to complete his doctorate in educational leadership. We have three kids, a 5-year-old boy who is starting kindergarten in the fall, a 3-year-old girl who is starting preschool in the fall, and a 5-month-old boy. We live in the same neighborhood as my family — my mom and dad, sisters and their husbands and children, my brother and his children, two grandmothers, and many aunts, uncles, and cousins and their children. We are a very close family that support each other endlessly. My father has been an attorney in town for 36 years and my mom is a newly retired autism specialist for a local school district, who is now busier than ever consulting for school districts across the state. During the summer, my children stay home with my husband (yay school hours!) and during the school year, I bring them to my older sister’s house at 8:00 a.m. and my husband picks them up at 5:00 p.m. I work from home on Fridays year round and keep the kids home with me to save on childcare costs. We pay about $1,600 per month for four days of childcare a week, then another $150 per month for private preschool. I wake up with the baby around 5:30 a.m., change and feed the baby, then make a pot of coffee. While the coffee is brewing, I read the paper to the baby and wait for the big kids to wake up while my husband sleeps in. The big kids wake up around 7:30–8:00 with two of their cousins who had a sleepover the night before, and I turn on Sunday morning cartoons while the baby and I make eggs for the “bigs.” We all eat breakfast and get dressed and head to my parents’ house to play with cousins and make breakfast for my sisters and I. After the moms eat and the kids ride bikes in the driveway, my sisters and I discuss what we will do with the kids for the day. We decide to take the girls to the Mall of America to go to the American Girl doll store and have some fun without the boys. I pack up my kids in the car and head back home to wake up my husband and fill him in on the plans. He stays home with the 5-year-old and I take our 3-year-old daughter and the baby to MOA for the day. While we are gone, my husband and 5-year-old play video games, read books, play outside/mow the lawn, and do some laundry. We get home from the mall just in time for Sunday dinner at my parents’ house with my three sisters, one brother, and all of our spouses and children, plus two 90-year-old grandmas. We get home from dinner and take baths, read stories, and put kids to bed in time to watch Game of Thrones at 8:00 and enjoy a craft beer with my husband. 5:30 a.m. I wake up with the baby and make coffee after changing and nursing him. We play and talk and I check emails. 6:30 a.m. The big kids wake up and I make eggs and toast for the kids, then wake up my husband to play with the baby while I get ready for work. I dress the kids. 8:00 a.m. I hurry out the door to head to work. My husband gets the 5-year-old to summer school at 9:00 and picks him up at 11:30. 8:30 a.m.–5:00 p.m. Work: meeting with clients, potential client consultations, phone calls with clients and opposing counsel, draft correspondence to clients and opposing counsel, all while hooking myself up to my breast pump every two hours so that my baby has food for the next day while I am at work. 5:00 p.m. I head home and call my husband to talk about what we will do for dinner when I get there. 5:30 p.m. I get home and nurse the baby and talk to the big kids about their day while my husband makes dinner. Baths, then stories and some iPad time for the 5-year-old, then all kids to sleep by 8:00 while I check emails on my phone and snuggle them to sleep. I fell asleep with the kids for the night while my husband watches TV in the living room. 5:30 a.m. I wake up with the baby and make coffee after changing and nursing him, and we play and talk. 8:00 a.m. I hurry out the door to bring the baby to my sister’s for the day so that my husband can work on his dissertation. 8:15 a.m. My mother-in-law arrives to play with the big kids today. They bake banana bread in the morning, eat lunch, then walk to my parents house to swim in the lake with their cousins, where my sisters are hanging out with their kids, my baby included. They walk home from the lake around 5:00 and my mother-in-law is gone before I get home. 11:00 a.m. My office sponsored a golf hole at a local chamber of commerce golf tournament, so after my 11:00 pumping session I head to the golf course to help set up our items at the tee box, then rush back to the clubhouse to join my boss and coworkers at the golf cart to begin golfing for the day. 1:00 and 3:00 p.m. I jet back to the clubhouse to pump in their bathroom, check emails, and make phone calls to clients and opposing counsel, then head back out to meet my teammates and continue golfing. 5:30 p.m. We finish golfing, so I pack up and head home as quickly as possible so that I do not miss out on baths and bedtime with my kiddos. I talk to my sister about how the baby was that day on my 30-minute drive home. By the time I get home, dinner has been eaten, so I get the kids cleaned up, jammies on, stories read, and snuggle the kids to sleep. I check more emails and fall asleep with the kids. My husband and I lived in St. Paul when our first child was born. The thought of leaving him with a stranger while I went to work was heartbreaking — so we packed up and moved back to my hometown, where two of my three sisters are stay-at-home parents. My older sister agreed to keep my son and has taken my daughter and baby during the school year. I can drop them off in the morning knowing that they will be loved and cared for by my family all day. They will be “parented” the same way that they are in my home, they play with their cousins all day, and they spend time almost every day with my parents and two of my grandmothers. In the last six years, we have only run into a few situations where I had to have uncomfortable conversations with my sister regarding childcare-related issues. At the end of the day, there is no one that I would rather have my kids with while I am at work. 8:00 a.m. I hurry out the door to head to work. My husband brings the 5-year-old to summer school at 9:00, and picks up at 12:30 instead of 11:30 because he has tumbling across the hall after preschool class is over. They play after lunch until I get home from work. 9:00 a.m. I have a phone conference with a client while I pump at my desk, then prepare for upcoming mediations and hearings until I need to leave for my Rotary meeting in the town where I live, about 15–20 minutes away from my office. I have a brief Rotary board meeting before the full club meeting at noon. 1:00 p.m. I quickly leave so that I can pump in my car on my way back to the office while I speak to my paralegal on the phone about client issues that came up while I was at my Rotary meetings. I get back to the office and pump between scheduled client and potential client consultations and meetings. 5:00 p.m. I leave work and head home, call my husband to talk about what we will do for dinner when I get there. 5:30 p.m. I get home and nurse the baby and talk to the big kids about their day while my husband makes dinner. We rush out the door to the 5-year-old’s last soccer game — my husband coaches, and there are trophies and ice cream handed out afterwards. My sisters and the cousins join in on the ice cream fun, then we drive home around 8:30 p.m. Baths, then stories, and everyone passes out while I check emails on my phone and snuggle them to sleep. I fell asleep with the kids for the night while my husband watches TV in the living room. 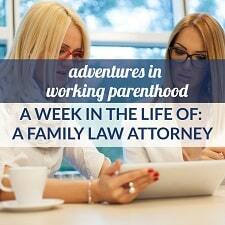 I had my first child a few weeks after I passed the bar exam, so I don’t know anything different. I was put on this earth to be a mother and a helper, and I have found a way to do both — AT THE SAME TIME. I grew up watching my mother, aunts, and grandmothers raise large loving families, run very successful family-owned businesses, nurture their marriages, and help their communities. As I was growing up and making choices, I never considered an alternative. I will say that after I had children, I found that my motivations for giving back to my community had shifted slightly. I began to view my work and volunteer efforts as a way to make this place I have chosen to raise my children in, better for everyone so that it is better for them. This is the reason that I joined my local Rotary International chapter and got a seat on the Rotary International Foundation board and became the community service chair on the club board. I also joined the board of my local bar association district, and just finished my term as the president, so that my passion for helping others, especially low-income members of my community, through the legal system when their families are in crisis had potential to become a priority for the other members of the bar association. At the end of the day, I feel so blessed to have three healthy, happy, beautiful babies; a busy, successful law practice; and an amazing supportive husband and family. I have found that I can do more, say more, and physically be in more places in one day than I ever thought possible before I had children. Somehow, I just put one foot in front of the other and take on one “task” at a time. 6:30 a.m. The big kids wake up and I make eggs and toast for the kids then wake up my husband to play with the baby while I get ready for work. I dress the kids. 8:00 a.m. I hurry out the door to bring the baby to my sisters for the day so that my husband can work on his dissertation. My mother-in-law arrives around 8:15 to play with the big kids today. They play games and Legos all morning, then walk over to meet my sisters at my aunt’s house to swim in the pool with their cousins. She leaves before I get home at 5:30. I have a day full of client meetings and phone calls scheduled around pumping and blocks of time set aside for working on client files. 5:00 p.m. I leave for the day. Before I left for work, my husband and I decided that he would throw in a pizza for dinner, and by the time I get home, they are already eating. I talk to my sister about how the baby was today on my way home. After we eat dinner, we go for a walk along the lake — I carry the baby in the Ergo while the big kids ride their bikes. We get home around 7:00, get them in the bath, read stories, and I snuggle them to sleep while I check emails. After the kids are sleeping, I go back upstairs and watch TV and talk to my husband. 5:30 a.m. I wake up with the baby and make coffee after changing and nursing him. We play and talk. 6:30 a.m. The big kids wake up and I make eggs and toast for the kids, then wake up my husband to play with the baby while I get ready for the day. 8:30 a.m. I check emails and call my paralegal to check in about what will be done that day at the office and which files need immediate attention. 9:00 a.m. We head over to my parents’ house to play with cousins and ride bikes. I check emails as they arrive in my inbox and deal with emergencies as need be throughout the day. I make lunch for 10 kids (mine and cousins) and bring it to the beach, where we swim and kayak the afternoon away. 1:00 p.m. My husband comes over and swims with the kids while I make phone calls to my paralegal and clients. 4:00 p.m. We have my siblings and their kids over for dinner every Friday, so we head home to clean up and get the grill started. 4:30 p.m. My family arrives and the kids play in the backyard while parents make dinner and hang out on the deck. 6:30 p.m. Everyone leaves for the night, and my husband and I get the kids in the bath and jammies and let them watch a movie and have popcorn. 8:00 p.m. They ask to go to bed. I stay up and check emails and talk to my husband until 10:00. Without the support of my parents and sisters, I would not be able to keep my kids with me while I work from home. During the school year, if I have to make a phone call, my mom or one of my sisters will keep my kids so that I can focus 100% of my attention on that call. During the summer months, my husband will keep the kids away from my home office so that I can have quiet as well. 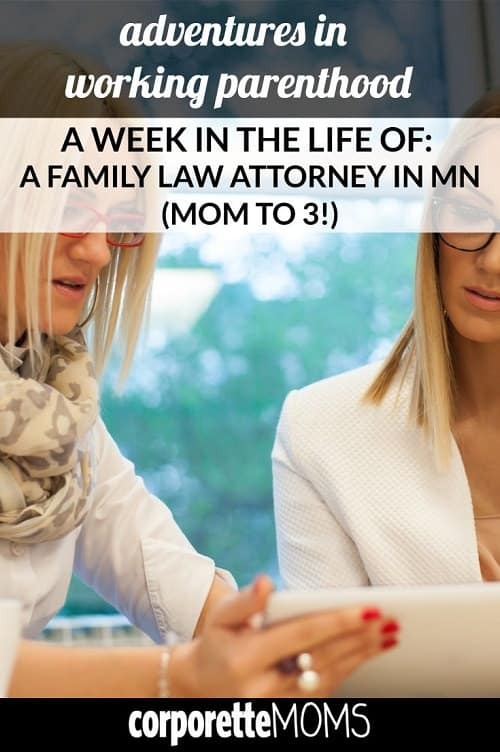 Equally as important is the support that I get from my employer and my paralegal that allows me to be home with my kiddos during the workweek. I wake up with the baby around 5:30 and make coffee after changing and nursing him. We play and talk until the big kids wake up around 6:30. I make eggs and toast for the kids, then wake up my husband to play with the baby while I get ready for the day. I dress the kids, then we head to the beach/my parents’ house for the day. Not much work gets done on Saturdays; we just spend the day doing whatever we want to do until dinner, bath, and bed. My husband puts the kids to bed tonight while I watch Real Housewives on the DVR and have a beer while holding the sleeping baby. Thanks so much to C for sharing a bit of her life as a working mom! 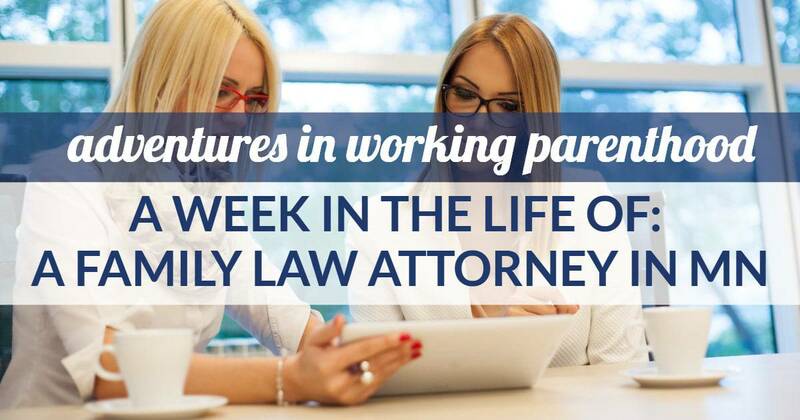 Readers, what’s your biggest takeaway from her week of work as a family law attorney as well as her general work/life balance? I love reading these – thanks so much to C for sharing! I so admire that you and your husband have prioritized extended family involvement. One question that I had when reading through your week – when do you and your husband take care of grocery shopping, house cleaning, etc.? You seem to fit in so much fun! And my non-working time so often gets sucked up by these other tasks. I would love to spend full Saturdays doing something fun like going to the beach, but as a family with two working parents we can never seem to carve out that much time and still be able to keep life running smoothly. I am not the featured woman but I will say that FreshDirect and my biweekly cleaning lady are literally 50% of how I make my life work as a mom with a 60 hr a week plus job (and husband who works even mor ehours). +1. The cleaning I do between our cleaning person’s visits is so limited – it’s really dishes and laundry only. Also not OP, but weekly cleaning service means that we spend very little time cleaning the house which used to eat up our free time on weekends. My husband also works from home and has a lot of flexibility so he is able to handle workers at the house, handle a few maintenance tasks, etc. during the week. Once our kid reached school age, weekends became easier (self-amusement and no naps) and harder (increased sports/social commitments). But, I have no qualms about planning a very basic weekly menu and grocery shop for 8am on a Sunday so that we can meet our friends at the pool later. I got the impression this week was during the summer when poster’s husband is at home, so perhaps he is doing some of this during the week while poster is at work? In any event, I agree that it is nice when this stuff is explicitly in the posts. This was kind of tough to read because I am SO jealous of your big, supportive family. You are very lucky! This is how I felt reading too! I have always dreamed of having a large, supportive, local family where all the cousins spend time together. This will never be a reality for me but I am grateful to at least have my parents local now and see that they are actively involved with our kid(s). BTW, minor thing that may just be my issue with wording, but daycare providers are only strangers on day 1 :) I have loved getting to know our son’s daycare teachers and it makes me so happy to drop him off there with providers who love their jobs and truly get to know and care for all of their kids. I had the opposite reaction. This much time with extended family would make me break out in hives. Maybe it’s an introvert thing but I can’t imagine seeing my parents or sister multiple times per week. I can certainly see the benefits of having local family to help w childcare, but if this is the price I’m fine having to use PTO every time my kids get sick and can’t go to daycare. Your life reads like a dream, albeit one I would likely never be organized enough to pull off! I always admire working moms who manage to do anything else besides working and mom-ing. I know I don’t (but in fairness to myself I also have no local family). Either way congrats on having really figured it out. agreed, it sounds like OP fits in a lot of fun with all her work! Thanks for sharing. Curious to hear how you work around naps? I feel like we are unable to really do anything on the weekend because my 2 year old and 6 month old both sleep so much and I’m hesitant to mess with it. Gently, I cringed a bit with your comment about childcare. Maybe I’m oversensitive to it because I have no choice, but I have heard many people say that they just “couldn’t” leave with their child with a “stranger” since I’ve been a mother. Usually it’s SAHMs that say it. Either way it makes me go “OOF. well it is hard….but that “Stranger” isn’t a stranger for long…..” They usually then say “oh I know it’s fine for you, but I just COULD NEVER do it”. That really rubbed me the wrong way too. It’s great that you have local family but there’s absolutely nothing wrong with daycares or nannies and as Elisa pointed out, anyone who watches your child become very familiar to your kiddo very quickly. Fwiw, our nanny is out of town this week and my mom is here watching the baby and even though I know I am objectively so lucky to have this kind of backup coverage, my mom is driving me absolutely crazy. She has her own way of doing everything and although she’s incredibly loving and my daughter adores her, in less than 4 workdays she’s managed to completely mess up my daughter’s feeding and napping schedule. But I feel like I can’t explicitly tell her “No, this is not what I want you to do. Please do X instead” the way I can with a nanny we employ. This week has made me so very grateful that we pay someone who is not a family member to watch our daughter and that I feel comfortable giving that person explicit instructions about how to take care of my daughter. I don’t know about OP, but I always wonder this about some of our friends who seem to be much more active on weekends and for them it’s mostly a matter of they either don’t nap or they really work at it. One friend I asked about this basically just doesn’t prioritize naps because, in her words, “if we did, we’d never do anything.” Another has her husband basically drive the younger kid around so he can nap in the car while they are out and she hangs out with the older child who stopped napping. Her oldest only napped in the stroller (even at home) so they just had a good canopy for her when she was little and walked her around until she fell asleep. I think a lot of this stuff comes down to priorities and trade offs. It’s easy to look at someone’s life and think, “wow, they do X, how amazing!” but they most likely sacrifice other things to do it. Cleaning/cooking is another example of this. My friend who goes to the beach more is also ok with letting her laundry pile up for 2 weeks eating more freezer meals. This is not a bad thing or a good thing. But when you read these posts this kind of detail may be getting left out, even if unconsciously just because it’s not a priority. I tend to bristle at comments at both ends of the spectrum…the “I could NEVER leave my kids with strangers” as well as “I could NEVER be a SAHM.” Both just come off as insulting to so many others, however unintentionally. This bothered me too. I am happy for you that you have an arrangement that works for your family, but there’s nothing wrong with having a “stranger” (and yes, daycare providers and nannies are only strangers on day 1) take care of children when parents are at work. Nothing. My children have benefited tremendously in many ways through their relationships with teachers and friends in daycare, just as I imagine your children have benefited from their relationship with your family members who provide childcare. One is not necessarily better than the other. There are pros and cons to everything. +1 – LOVED reading this! Your situation sounds idyllic, and at the same time, like a lot of hard work and coordination (which is…being a working parent). I have a pretty big family in my homecity, and we plan to relocate for more support, but even then they live in the suburbs and we need more of a city life so won’t be as close. This makes me flirt briefly with the idea of living the same suburbs as all of them! Get over yourself! We all work and raise children, and most of us do it without the benefit of local family. I agree. If I felt that I had found the magical winning combination of childcare, work, and personal interests, I’d shout it from the rooftops. Also, I have a really hard time faulting the OP for leaning so heavily on family support (or talking how much she relies on her family) – she and her husband moved back to her hometown specifically so they would have that support. Yep, the lead teacher in my son’s infant room (he’s now 3) is now our baby sitter and lead for my infant daughter. She’s much less of a “stranger” to my kids than their grandparents, who see them a few times a year. And she has a degree in early childhood education, and has seen it all. And she knows she works for me; the daycare center is almost always open; and my kids get a crazy amount of enrichment and socialization. So, yeah, the “stranger” thing is . . . Meh. So I would never say it this way and I agree that it was a poor word choice. But if I may – when I went back to work after my daughter was born, we had family help out and it definitely made it easier on me psychologically to go back because I didn’t FEEL like I was leaving her to go to work but rather just having her spend time with her relatives. I fully appreciate that this is something I felt because of all the f-ed up messaging we get, particularly as women and even more specifically as mothers, but it was still how I genuinely felt. And I would never say “oh I just couldn’t have done it any other way” because I could have if I had to (and so could C if she didn’t have her option available) and I probably would have been fine and I am sure my daughter would have been fine, but the fact is that it made my transition back easier *for me. * This may not be true for everyone. I think in many ways it depends on your relationship with your family (I have plenty of friends who would never be comfortable with their parents/inlaws watching their kids), but I kind of get the sentiment even if it could have been said in a much, MUCH better way. This really rubbed me the wrong way, too. I’m 100 percent confident in our choice to use daycare NOW, but as a newer mom, that comment would’ve been sent me into a shame spiral. Our daycare teachers aren’t family, but they are definitely part of our village. My son has been out of daycare/preschool for years, and we’re still in contact with most of his former teachers. Eh different people can make different choices, but agreed that I love the structure, enrichment and socialization that my daughter gets in daycare and definitely don’t think it’s an inferior choice to family caregivers. +1. We live 1 mile away from one set of grandparents and 5 miles away from a second set. All the grandparents work full-time, and none of them would be a good choice for full-time care. We had a wonderful nanny for a year, and now Kiddo is in daycare with incredible teachers. DH is a SAHD, so we have the option of keeping Kiddo at home with family, and I think daycare is a better choice for a lot of reasons specific to our family and our kid. I just loved the wording of how you wrote that you talk to your baby and read the paper to him! Sorry for offending anyone and everyone. I cannot make everyone happy- I am not an avocado. Have a great weekend mamas!! Thanks for sharing! I love this series and would love this much cousin time. Glad you are making it work for your family! I love my kids daycare. Sounds like OP loves her childcare situation. Her set-up wouldn’t be right for me, and mine isn’t right for her. All of that can co-exist at the same time and I certainly don’t feel judged because she happens to prefer a different childcare setup than me. Thanks for sharing, C! Maternity leave question… I’m getting ready to go out on leave with baby #2, and I’m trying to figure out how long to take and would appreciate some advice from other bosses out there… How much maternity leave is “appropriate” for someone in a leadership role? How do you balance the pressure of coming back earlier (say, after 3 months) with the desire to come back a little later (say, 5 months?) My company doesn’t have a formal leave policy and doesn’t offer paid leave other than accrued PTO, so I’m going to end up taking some time unpaid no matter what I do. I’m just trying to balance feeling the pressure from my staff and my own boss to come back in order to manage my department, but I know how hard it is to transition back to work with a newborn. Any suggestions or feedback? This truly is a dream life to me. There is nothing that I wish we had more than family to help, and lots of constant companions for my kids (the cousins that you mention).